Over ten months I explored the King County Trail System. I created, in collaboration with Susan Robb , Caribou: a Walking Game (video below). We led a "A Long Walk" from Seattle to Snoqualmie Falls (40 miles in three days). I also gathered stories from the public about their experiences on the trails and posted them at TrailsProject.com . Photo collage and stories: one, two, three, four. Caribou (3 min. video). We're all on a deadline. Maybe that's why I'm on this walk. There's no deadline. I can do whatever I want. There's no management, no supervisor. I'm a designer so I like to look at things... 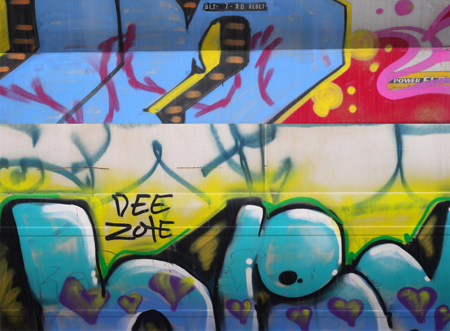 I thought I'd take some pictures of the graffiti on these rail cars because some of it's art.